Review by Mollie! on 11/26/2012. This map is of Canada. I couldn't identify Prince Edward Island. Luckily, I was playing with a native Canadian who directed me to "Google it." Thanks Doug. Our alliance ended sadly when you let Dylan kill everyone. Review by Karstark on 7/9/2013. Fun and simple map. Technically NL is not a part of the Maritime provinces though... I would call the group of NL, NB, PEI, NS the Atlantic provinces instead. Review by TheCatGuy on 9/24/2015. 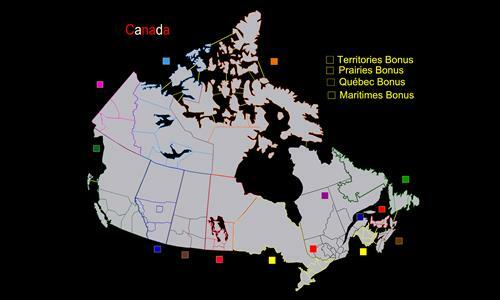 A pretty strategic Canada map, it forces you to think about your territories and your bonuses in a way I don't see often. Review by Alexander Mapping on 3/3/2017.